Citizens Advice Peterborough will be able to give valuable information and guidance to even more residents thanks to £288,000 of government funding. The current demand for the service based at St Mark’s Street is so high that staff can often not see everyone that requests their support. 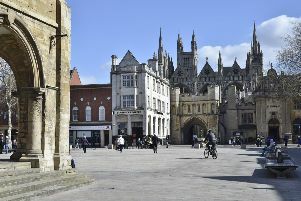 This is due to Peterborough’s growing population and people from a migrant background looking to get the advice they need to help settle into life in the city. This additional two year funding follows a bid to the Controlling Migration Fund (CMF) by Peterborough City Council. It will fund the project called Shared Vision which will see new advice services based at community locations such as GP practices and other community hubs throughout Peterborough. It will help to increase reach and access for many people who are unable to use the city centre service and it is estimated that 4,000 additional clients will be supported each year. Councillor Irene Walsh, cabinet member for communities, said: “The current service on St Mark’s Street can sometimes have 30 per cent of clients unseen on any given day due to a lack of capacity. “Around a quarter of clients attempting to access the service are migrants and this further drives demand. Keith Jones, chief executive of Peterborough Citizens Advice Bureau, said: “This additional funding is really welcome at a time when people are struggling to gain access to our general advice service due to growth in the city and rising demand. Citizens Advice offers free, practical guidance that is independent, impartial and confidential. The areas they support with include debt, housing, benefits, welfare rights and queries on employment and immigration. The city has also received £250,000 funding up until August 2019 to support rough sleeper support services. The CMF funding will be used to reduce the impact of rough sleeping on Peterborough’s communities and to improve outcomes for EEA (European Economic Area) nationals who are rough sleeping by providing support and assistance to enable them to leave the streets.